Dilbilgisini açıklamak ve tanımlamak için birçok yol vardır; basit bir şekilde bu, kelimelerden cümlecik, cümle ve cümlelerden paragraflar oluşturmak için kelimelerin biçim değiştirmesi ve diğer kelimelerle birleşmesi ile ilgili bazı kuralların tanımlanması olarak belirtilebilir. Dil öğretmenlerinin dilbilgisi öğretiminde kişisel fikirlerini de dahil etmeleri, öğrenciler üzerinde bir etki bırakmaları açısından en iyi yoldur. Dilbilgisi öğretimi alanında birçok çalışma tamamlanmasına rağmen, Türkiye’de İngilizce yabancı dil öğretmenlerinin sunum ve alıştırma yaparak, dilbilgisel yapıları öğretmeleri hususları açık bir şekilde vurgulanmamıştır. Bu makalenin amacı; dilbilgisi öğretiminde, İngilizce yabancı dil öğretmenlerinin dilbilgisi öğretme yaklaşımlarını tanımlamak, durumsal dilbilgisi kavramını açıklamak ve çözüm önerileri sunmaktır. While there are many ways to describe or explain grammar, simply, it is defined as a set of rules about how words change their form and combine with other words to make clauses into sentences and sentences into paragraphs. Yet an important consideration, having an effect on the ways language teachers teach grammar is the teachers’ personal ideas on the best way to teach grammar. In spite of many studies that have been completed in this field, the ideas of EFL teachers about presenting, practicing, and teaching grammar has not been studied in depth in Turkey. So, the aim of this article is to discuss the EFL approach to teaching “situational grammar” as a remedy to the teaching of grammar in the Turkish classroom. İngilizce öğrenimi, çözüm, öğretim, dilbilgisi öğretimi. English learning, solution, language, instruction, grammar teaching. Alijanian, E. (2012). An Investigation of Iranian EFL Teachers’ Beliefs about Grammar. Journal of Education and Social Research. 2 (3), 335-340. Batstone, R., & Ellis, R. (2009). Principled grammar teaching. System. 37. 194-204. Borg, S. (1999). Studying teachers’ cognition in second language grammar teaching. System. 27 (1). 19-31. Brown, H. D. (2007). Teaching by Principles: An Interactive Approach to Language Pedagogy. New York: Pearson Education Inc.
Dekeyser, R.M. (1995). Learning second language grammar rules: an experiment with a miniature linguistic system. Studies in Second Language Acquisition. 17. 379-419. Dewey, J. (1938). Logic: The Theory of Inquiry. Holt, Rinehart and Winston, New York. Ellis, R. (2002). “The Place of Grammar Instruction in the Second/Foreign Language Curiculum.” In Eli Hinkel and Sandra Fotos (Eds. ), New Perspectives on Grammar Teaching in Second Language Classrooms. New Jersey: Lawrence Erlbaum Associates. Ellis, R. (2006). “Current Issues in the Teaching of Grammar: An SLA Perspective.” TESOL Quarterly. 40(1), 83-107. Ezzi, N. A. (2012). “Yemeni Teachers’ Beliefs of Grammar Teaching and Classroom Practices.” English Language Teaching, 5, 170-184. Mohamed, N. (2006). An Exploratory Study of the interplay between teachers’ beliefs, instructional practices and professional development. Doctoral Dissertation. The University of Auckland. Mukminatien, F. N. (2008). “The Place of Grammar: An Attempt Towards A Synthesis Of Its Teaching Approaches.” Bahasa Seni Dan, 36(1) 80-87, Jurusan Sastra Inggris Fak. Sastra Universitas Negeri Malang University Press, USA. Nassaji, H., S. Fotos (2004). “Current Developments in Research on the Teaching of Grammar.”Annual Review of Applied Linguistics, 24, 126-145. Thornburry, S. (2001). How to Teach Grammar. London: Pearson Education Limited England. ISNAD TOSUNCUOĞLU, İrfan . "Durumsal Çerçevelerde Gramer Öğretimi". 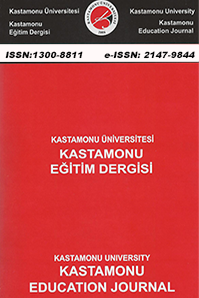 Kastamonu Eğitim Dergisi 24 / 4 (September 2016): 2099-2104.